Set containing both parts of Quentin Tarantino's hugely popular martial arts homage. In 'Kill Bill - Volume 1', Uma Thurman stars as The Bride, one-fifth of a team of assassins called DiVAS. When she decides to get married and leave the outfit her boss, Bill (David Carradine), is not a happy man and gets her former colleagues to show up at the wedding; leaving behind a blood bath and The Bride shot in the head. Four years later, The Bride sets out on a journey of revenge which is ultimately to kill her former boss, Bill. In 'Kill Bill - Volume 2' (2004), having dispensed with former colleagues O-Ren Ishii and Vernita Green in the first volume, The Bride (Uma Thurman) resumes her quest for justice in this second installment of Tarantino's jaw-droppingly violent homage to action films from both East and West. The Bride now has two remaining foes on her 'Death List', Budd (Michael Madsen) and Elle Driver (Daryl Hannah) - before she moves on to her ultimate goal - to kill Bill (David Carradine). Set containing both parts of Quentin Tarantino's hugely popular martial arts homage. In 'Kill Bill - Volume 1', Uma Thurman stars as The Bride, one-fifth of a team of assassins called DiVAS. When she decides to get married and leave the outfit her boss, Bill (David Carradine), is not a happy man and gets her former colleagues to show up at the wedding; leaving behind a blood bath and The Bride shot in the head. Four years later, The Bride sets out on a journey of revenge which is ultimately to kill her former boss, Bill. 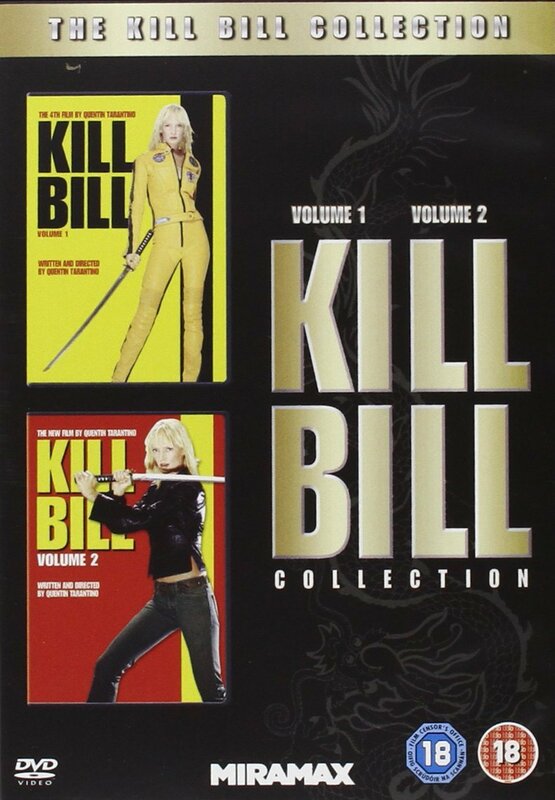 In 'Kill Bill - Volume 2' (2004), having dispensed with former colleagues O-Ren Ishii and Vernita Green in the first volume, The Bride (Uma Thurman) resumes her quest for justice in this second installment of Tarantino's jaw-droppingly violent homage to action films from both East and West. The Bride now has two remaining foes on her 'Death List', Budd (Michael Madsen) and Elle Driver (Daryl Hannah) - before she moves on to her ultimate goal - to kill Bill (David Carradine).